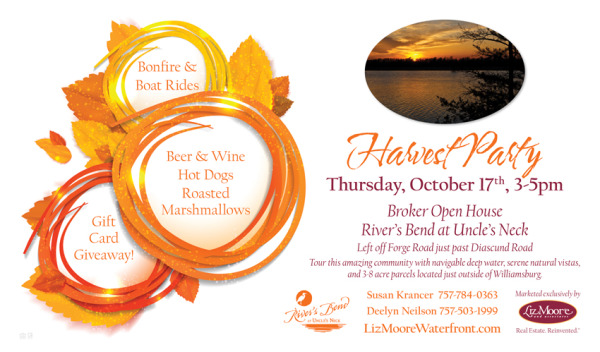 Join us for a Harvest Party at River's Bend at Uncle's Neck on Thursday, October 17th from 3-5pm. Come tour this stunning waterfront community and enjoy wine, beer and hotdogs, bonfires and boat rides, and register for a gift card giveaway. Bordering the Chickahominy River with riverfront and creek front sites available, River's Bend at Uncle's Neck offers a rare opportunity to own acreage on navigable deep water. Residents can enjoy the various recreational opportunities including boating and fishing on Uncle's Neck Creek or the Chickahominy River, nature trails and wildlife meadows. This is an unparalleled opportunity to own waterfront property in a highly desirable location. Our preferred builders would be happy to walk lots you and answer any questions you may have about this special community. Email us at concierge@lizmoore.com to arrange a tour, or click below to request a River's Bend at Uncle's Neck Info Packet.